Burning mouth syndrome (BMS) is a chronic pain condition characterised by a persistent burning sensation in clinically normal oral mucosa. BMS most commonly occurs in middleaged and elderly women. Various local and systemic factors can cause oral burning symptoms. When all possible local and systemic factors are excluded, burning mouth symptoms can be diagnosed as BMS. Psychophysical tests and histopathological data suggest the involvement of peripheral and central neuropathic mechanisms in BMS etiopathogenesis. Psychological problems are frequently observed in BMS patients. Several mechanisms, including increased parafunctional habits, steroid dysregulation, central disinhibition due to taste dysfunction, and low dopamine levels in the brain, have been proposed as an explanation for the role of psychological factors in BMS pathophysiology. However, the causal relationship between BMS and psychological problems remains controversial. Given the neuropathic nature of BMS, treatment for it is similar to other neuropathic pain conditions. Although various treatment modalities, including pharmacological intervention, behavioural therapy and psychotherapy, have been proposed, there is no definitive treatment always effective for the majority of BMS patients. In conclusion, for better understanding of the relationship between BMS and psychological factors, well-designed prospective studies are needed. In addition, the evaluation and treatment of psychological problems are essential for successful management of BMS patients. Objective: To identify a panel of differentially expressed candidate biomarkers for patients undergoing accelerated osteogenic orthodontics (AOO). Methods: This study included 36 saliva samples taken from six Class III surgical patients at six time points: the date before the corticotomy procedure (T1) and at 1 week, 2 weeks, 1 month, 2 months and 6 months after the procedure (T2, T3, T4, T5 and T6, respectively). After the maxillary dental arch was aligned and levelled, AOO procedures were performed in the maxillary alveolar bone. Saliva samples were used to create peptide mass fingerprints using matrix-assisted laser desorption/ionisation time-of-flight mass spectrometry (MALDI-TOF MS) combined with magnetic beads. Results: When the six groups were compared, 182 peaks were significantly different (P < 0.01), and the biomarker profiles changed over time. After corticotomy, the mass peaks predicted to be the Apolipoprotein A-I precursor (APOA1) increased sharply in T2 then decreased. The peptides predicted to be complement component 3 decreased in T2, then gradually increased and declined in T6. The peptides predicted to be the vitamin D-binding protein precursor increased in T2, then fell to the preoperative level. The mass peaks of the peptides predicted to be Isoform 1 of the fibrinogen alpha chain precursor (FGA) first decreased, then increased with time. Conclusion: The salivary protein profiles changed with accelerated tooth movement induced by AOO. 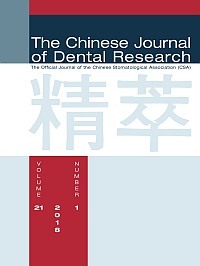 This method provides a tool for investigating corticotomy-induced accelerated tooth movement in humans, and explored the critical factors responsible for the regional acceleratory phenomenon.